Human Rights Watch published a comprehensive report on persecution of Turkish lawyers named ‘Lawyers on Trial’. According to the report, 1546 Turkish lawyers have been prosecuted and 598 lawyers have been arrested since 2016 July. And so far, 274 Turkish lawyers have been sentenced to 1762 years in prison by the first instance courts under article 314 of the Turkish Penal Code. Ankara 22nd Heavy Penal Court sentences 22 lawyers to some 150 years in prison. Lawyers who were detained on 3rd and 26th of August 2016, were convicted under Article 314§2 of the Turkish Penal Code which criminalizes membership to an armed terrorist organization. 18 lawyers were sentenced to some 160 years in prison by Istanbul 37th Assize Court under Article 314 of the Turkish Penal Code which stipulates the armed terrorist organization. So far, Turkey have sentenced 248 lawyers to 1603 years in prison. Turkish Parliament Speaker’s recent undue interference in the appeal process is seen by many as the final nail in the Commission’s long diminishing respectability. The Arrested Lawyers have produced GIFs for awareness raising campaign carried out on the occasion of Day of the Endangered Lawyers. Avrupa Konseyi Bakanlar Komitesi 30 Ocak 2019’da Adli ve Idari Yargılamalarda Elektronik Delillere Dair Kilavuz Ilkeleri yayınladı. Onemli ilkeler ihtiva eden Kilavuz Ilkeleri Arrested Lawyers Initiative Turkce’ye tercüme etti. 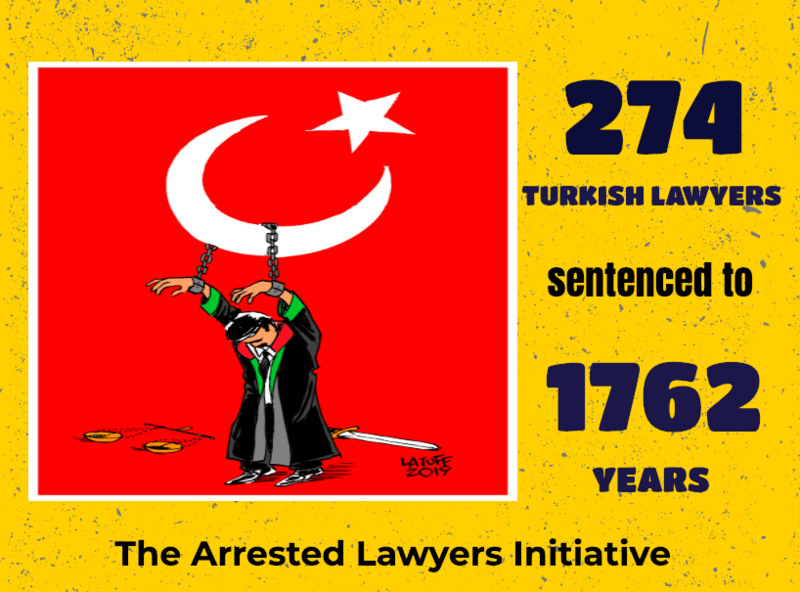 On the occasion of Day of the Endangered Lawyer 2019, the Arrested Lawyers Initiative has worked with two great artists, Mr Carlos Latuff and Mr Aseem Triverdi, to raise awareness on the plight of Turkish lawyers. Denizli 3rd High Assize Court convicted thirteen (13) lawyers of the membership to the armed terrorist organisation and sentenced them to ranging from two to ten and half years. By this latest decision to convict, numbers of Turkish lawyers so far have been convicted of terrorism-related offences since 15th July 2016 raised to 138. Denizli 2nd High Assize Court convicted eight lawyers of the membership to the armed terrorist organisation. Numbers of Turkish lawyers so far have been convicted of terrorism-related offences since 15th July 2016 raised to 125. The Council of Bars and Law Societies of Europe (CCBE) firmly condemned the ongoing crackdown against lawyers in Turkey. Our Statement Regarding 5th of April, Lawyers Day in Turkey. On the occasion of Lawyers Day in Turkey, we urge the Turkish Government to take steps to ensure that all jailed lawyers are immediately released and the charges against them dropped, to take all necessary measures to guarantee the physical and psychological integrity of lawyers in Turkey, as well as their ability to perform their professional duties without fear of reprisal, hindrance, intimidation, or harassment. On the one hand, Erdogan Regime introduces many restrictions on the right to defence and the rights and authorities of the lawyers, on the other hand, grasps control of the recruitment mechanism for the profession of law with the cooperation of Metin Feyzioglu. On the occasion of #HumanRightsDay, The Arrested Lawyers Initiative opened online photography exhibit (“Turkey Under the State of Emergency”) to raise awareness about human rights violation have been lived in Turkey. Since the day President Erdogan has intended to break away from the West and has embraced a religious rhetoric, the best way to get promotion in the Turkish bureaucracy is to have the affinity with one of the Sunni sects. The 20 Members of Konya Bar Association were sentenced range to 2 and 11 years only because of doing their profession with integrity. So far, 59 Turkish lawyers were sentenced to long imprisonment. The COE and The ECtHR bought Erdogan extra-time to continue the persecution that causes a humanitarian crisis. There is humanitarian crisis in Turkey; if it is not treated in democratic and judicial means next phase might be genocide or civil conflict.